During the battle for women’s voting rights in early 20th century England, suffragette leader Sylvia Pankhurst advised her followers to learn jiujitsu and start coming to meetings armed with sticks. “It is no use pretending,” she told The New York Times. 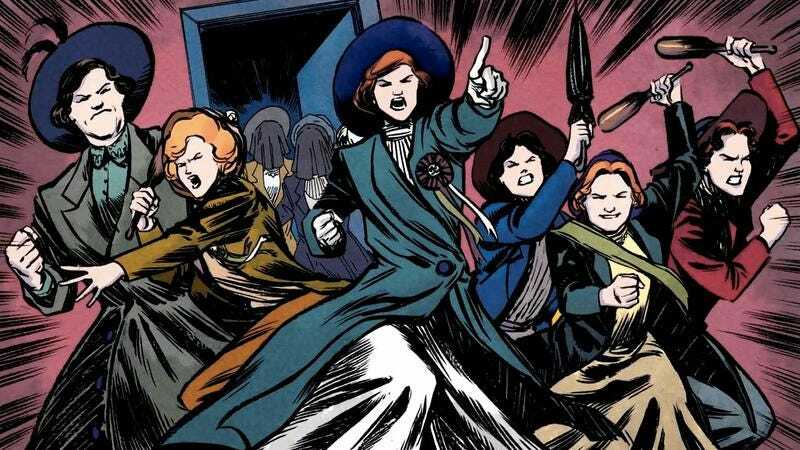 “We have got to fight.” That factoid is the foundation of Tony Wolf and Joao Vieira’s Suffrajitsu: Mrs. Pankhurst’s Amazons (Jet City Comics), a genre-defying period piece about the women who take up arms to gain political power in a world that wants to keep them disenfranchised. Part of Neal Stephenson’s trans-media Foreworld Saga, which details the secret history of a fictional world much like our own, Suffrajitsu is an exhilarating exploration of the suffragette movement that moves in surprising directions over the course of its three issues. Tony Wolf’s story begins with martial artist suffragettes fighting for the vote in England, but quickly grows to make Mrs. Pankhurst’s Amazons key figures in the events leading up to World War I, casting them as secret agents tasked with preventing an international incident. The first chapter is a captivating introduction to the concept and characters, emphasizing the reality of this struggle for these women before taking a sudden left turn that considerably expands the scope of the story, and later issues continue to impress as the creative team combines political commentary, sci-fi intrigue, pulse-pounding action, and intense character drama in one briskly paced narrative. Wolf has an exceptional collaborator in Vieira, whose clean, expressive style is reminiscent of the work of Wonder Woman’s Cliff Chiang. He does outstanding work capturing period details in the character and environment designs, and doesn’t allow the overbearing dress of the time to diminish the skill of these women as fighters. Wolf works primarily as a fight choreographer and action designer (including cultural fighting styles design for the Lord Of The Rings films), and Vieira and colorist Josan Gonzales capture the specific action beats of the script with full force. A particularly impressive page in issue #2 features main character Persephone Wright sparring with her uncle, and Vieira uses era-appropriate design elements to heighten the sense of motion on the page with shapes and color. The cover of Bucky Barnes: The Winter Soldier #6 (Marvel) is arresting on the shelf. It’s reminiscent of Dalton Trumbo’s Johnny Got His Gun in the best possible way, and Mike Del Mundo deserves a round of applause for the work he’s been doing on Bucky Barnes covers since issue #4. The art is one of the biggest draws of the title, from cover to cover, every issue. Ales Kot’s a talented writer, but he doesn’t show his hand quickly and reading Bucky Barnes requires a certain amount of patience. There are plotlines that began in the first issue that are only becoming clear now, and while that can be a little difficult to manage with weeks between books, the payout is there waiting. Like Kot’s work on the far too short-lived Iron Patriot, Bucky Barnes is about a soldier. First by choice and then by force, Bucky’s always been in that role, and seeing him walk through the arc from warrior to veteran is gratifying and in some ways very intimate. Particularly for fans who may have come into the title after the Captain America movies, it’s nice to see Bucky reach a point in his life where something other than violence is at least a possibility, and Kot is providing readers with a chance to see a character that has aged—a real rarity in comics. But the art is what makes this book stand out. Usually when an issue switches between artists, it’s either an anthology or an annoyance. But here, Marco Rudy provides the here-and-now for Earth-616, while Langdon Foss and colorist Jordan Boyd deliver memories from another time and place; the switch is key to piecing together how the story unfolds. Rudy has a rich style with unconventional layouts and watercolors, but even read on the heels of Descender it feels palpably different and shows just how far the medium can get pushed by two different artists. There are moments where the natives of Mer-Z-Bow look like they could be cousins of Miracleman’s Warpsmiths, with an almost retro vibe. Rudy does his best work, though, when Daisy Johnson, Bucky’s partner for the moment, and his lover, Ventolin, have a remarkable moment together toward the end of the book. Those pages also mean the issue passes the Bechdel test, even if one of the characters shares a name with an emergency inhaler. Sam Bosma delivers an irrepressibly fun, knowing, and breezy tale of sporting playoffs, magical mages, and surprisingly cute skeletons in Fantasy Sports (Nobrow). Originally self-published as a black and white, limited edition comic titled Fantasy Basketball in September 2013, this full-color, expanded, album-sized hardback version sees Nobrow provide Bosma’s art with the space, treatment, and (hopefully) wider audience it deserves. It was a good looking comic to begin with, but this colored edition is beautiful, with the bright jewel shades imbuing it with real oomph and personality—a buoyancy and light absent from it’s earlier incarnation. Fantasy Sports clumps together unlikely duo Wiz and Mug. The latter is in the apprentice stage of her career, and the former is more weathered, having been through various partners. The assigned partnership isn’t working out, however, and Wiz has officially requested a change of mentor, citing Mug’s refusal to listen and compromise as reasons. The request is turned down and the two are sent on a mission in a last-ditch attempt to show each that despite their differences, they must find common ground. It’s amusing to note that this is essentially a workplace conflict wrapped up in magical robes, but there’s as much a generational gap in comprehension and connection between the two as there is in difference of opinion in practice. Mug views Wiz’s approach as newfangled and ineffectual, while Wiz deems Mug’s methods as blunt and out of touch- an angle which offers a very current interpretation of proceedings. There’s nothing like a ring of fire to forge allies, though, and Mug and Wiz’s challenge comes in the shape of a seemingly decrepit, mummified figure whose treasure they’ve come to take. Naturally he has other ideas, and so the parlay of a basketball game is set. If he wins, they stay and become members of his enslaved undead; if they win, they are free to take the treasure and leave. Bosma riffs and rides the tropes with affection; there’s a fantastic moment when the mummy-dude, having agreed to the game, rises up slowly—this ancient, wrinkled looking figure, only to cast aside his swathes of robes to reveal a tall and lithe, sprightly frame clad in Converse shoes, a vest, and shorts. DC’s New 52 revamp has taken its toll on a number of characters. No character is more emblematic of these problems than Superman. Whereas Batman and Wonder Woman both jumped into post-Flashpoint continuity with better-than-expected relaunches, Superman stumbled. Grant Morrison fumbled the ball on the first year of his highly anticipated Action Comics. The creative turmoil behind the scenes on the eponymous Superman title became one of the first signs that much of the New 52 had in fact been a kluge assembled at the last minute, and without any real plan. The last couple years have provided a handful of glimpses of something better. Charles Soule’s work on Superman/Wonder Woman, Greg Pak’s run on Action, and the second half of the quite good Doomed crossover all seemed to be converging on the same set of ideas. To wit: Superman was broken pretty badly by the New 52, the victim of a bunch of half-baked ideas that failed to cohere, leaving the world’s greatest superhero weighed down with a heap of “cool” revamps that only succeeded in coating the character in unnecessary layers of grime. What was needed was nothing less than a return to the character’s roots. DC spent too long running away from what makes Superman work, and it was time to come home. Superman #39 (DC Comics) represents the first time since Flashpoint that Kal-El has actually seemed like his old self. Superman shouldn’t be a smug, occasionally sarcastic Übermensch in shiny alien battle armor. He should be strong, but he must also be humble and kind. It’s not for nothing that the most iconic Superman moment of the last decade is the single page in All-Star Superman #10 where he saves a teenage girl from suicide by telling her, “You’re much stronger than you think you are.” That guy has been MIA for a little while, but thanks to Geoff Johns and John Romita Jr., he’s back.